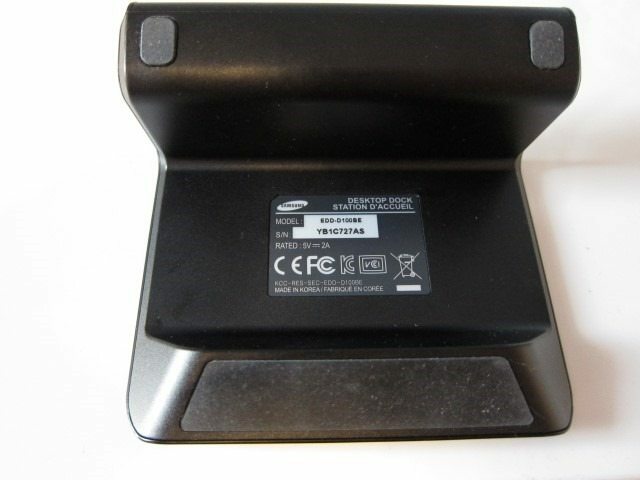 The Desktop Dock for the Note 10.1, also known as the “EDD-D100BE” is as the name implies a desktop dock with the added functionality of a 3.5mm audio output. It connects to the Note 10.1 through its 30 pin connector, but luckily adds a 30 pin connector on the back, freeing up the port. At around 40 to 50 dollars, the EDD-D100BE just like many Samsung original accessories, it’s quite expensive. This dock is a departure from previous more traditional looking docks made by Samsung and has a stylish folded origami-like and minimalistic look. 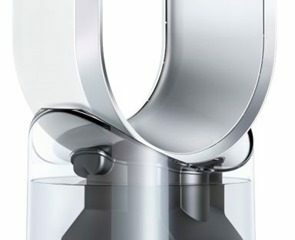 It has a very flat folded design, looking like a piece of cardboard folded in a specific way to stand upright. Because of this flat design, the Note 10.1 looks like it’s floating when seen from the front. 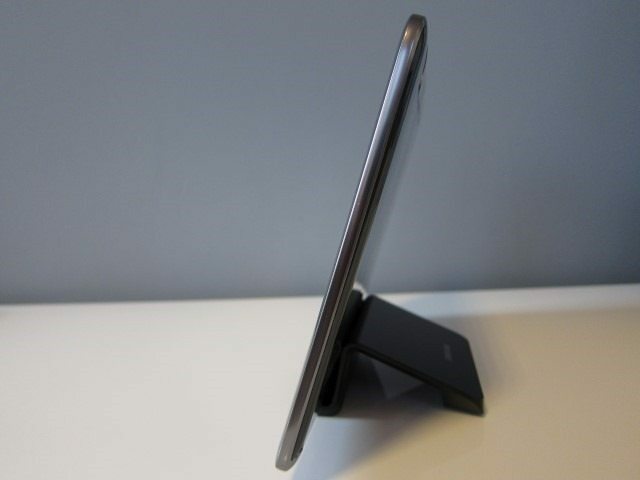 When seen from the side it’s slightly tilted backwards with the dock looking impossibly thin to even hold the tablet upright, adding to the “floating” look. Don’t let the slim design fool you, the accessory simply exudes quality without a single creaking sound, the EDD-D100BE is one solid piece of plastic. The way the materials look and how it all comes together shows that it might be expensive, but you do get what you pay for. 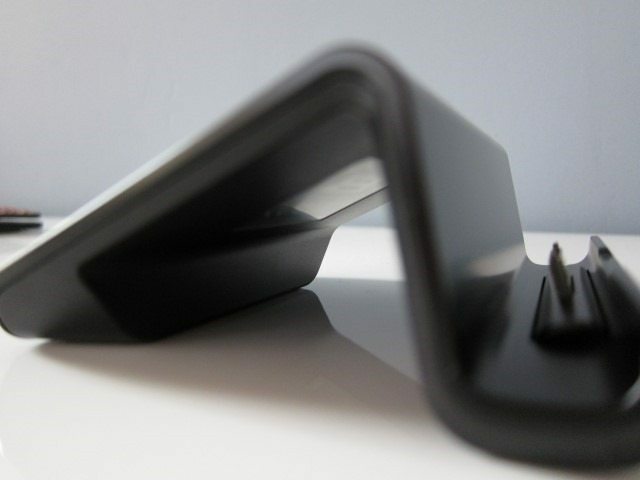 The dock comes in two colors: White and Black with the White model using the glossy look similar to the White Note II. The Black looks more like dark Grey with the matching brushed aluminum look Samsung used on their inspired by nature devices like Note II and S III. Samsung has been really pushing this “inspired by nature” theme with organic looking colors and materials and it’s nice to see the same theme carried onto their accessories. Inside the dock you’ll find the 30 pin connector and in front of it there’s a cut out area that serves the purpose of aligning the tablet with the 30 pin connector when putting the tablet in the dock. 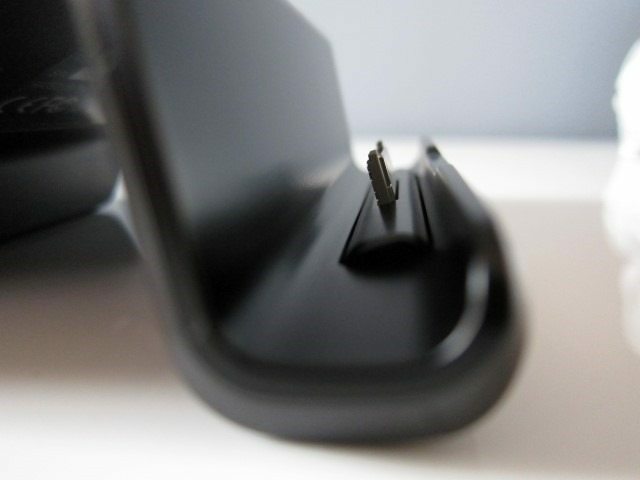 The tablet itself blocks the connector, making it difficult to align properly with the 30 pin connector, but that’s where the cut-out comes in. 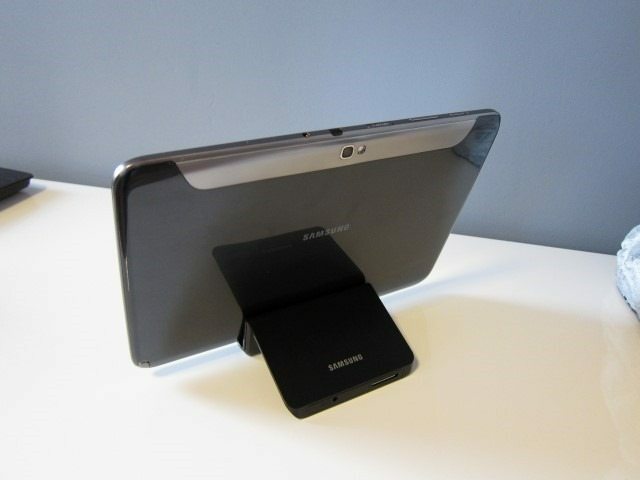 As the Samsung logo sits neatly inside this cut out, it helps to align the port on the tablet to the connector on the dock. 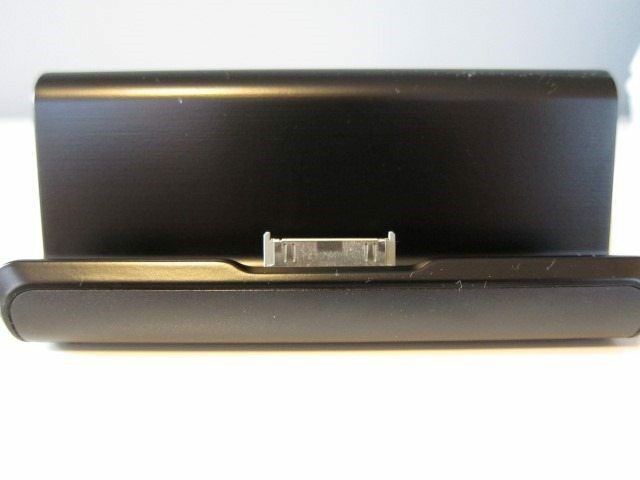 Behind the area where the tablet attaches to the connector, the dock rises and slants backwards providing an area where the tablet can rest against. 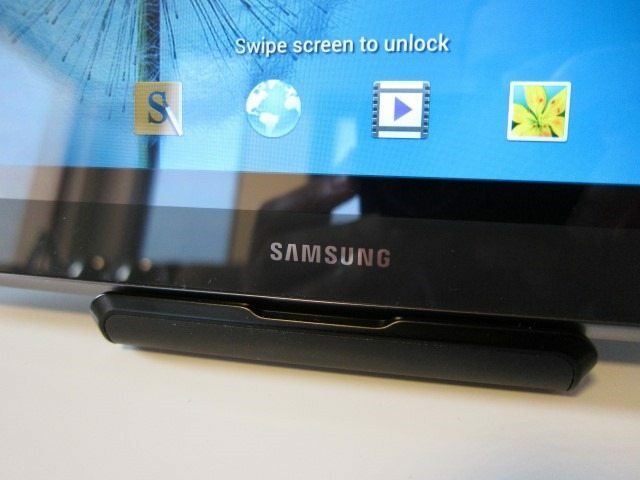 It’s completely free of any features with only the Samsung logo painted on the flat surface. All the magic happens at the back of the dock where you’ll find the 3.5mm audio jack and the 30 pin port. We can’t help but feel that the dock’s potential hasn’t been fully achieved. For example adding a few USB ports and an HDMI port would have been perfect and appropriate for a product as powerful as the Note 10.1. This would undoubtedly make it a bit more expensive, but the convenience would have definitely balanced things out. 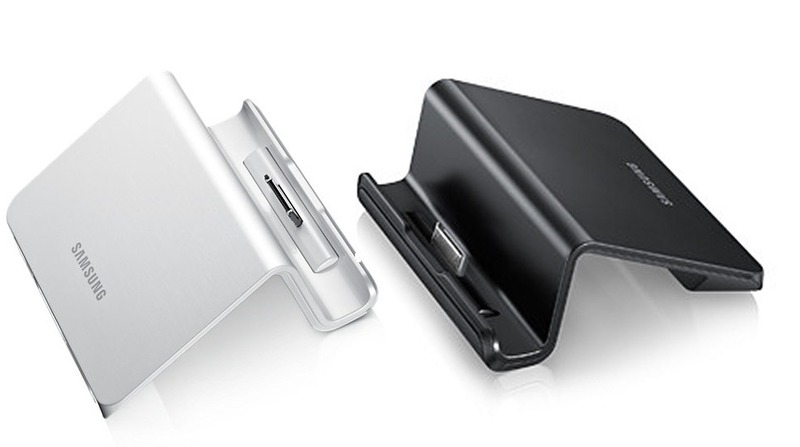 Take for example the Note II Smart Dock, which not only offers the 3.5mm audio out, but also HDMI and 3 USB ports. In comparison to the Note II Smart Dock, this dock is good, but again feels like it hasn’t been fully realized. 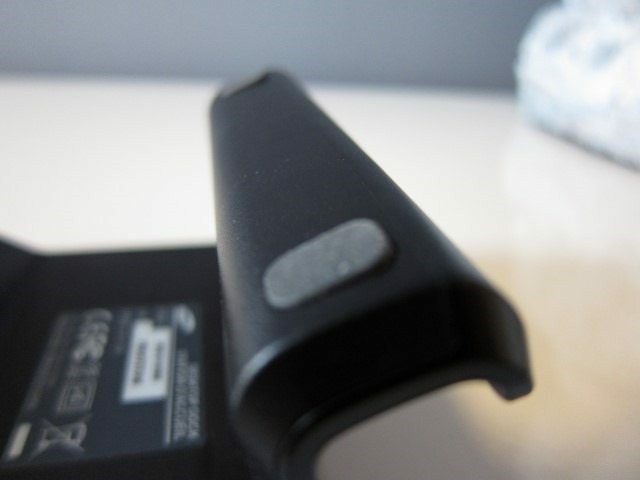 With the tablet in the dock there’s a little bit of play: it can be moved forward a bit and if you push hard enough it can potentially do damage to the connector, dock or tablet. This is in part due to the folded design of the dock: it looks great, but it’s unconventional design doesn’t have edges to keep the tablet in place. This allows for some forward movement when moving around with the tablet in the dock or if you accidentally bump against the tablet. If the dock is resting on a flat surface this shouldn’t be a problem, but just be aware that it allows for more movement then a traditional dock and as a result requires a bit more care. 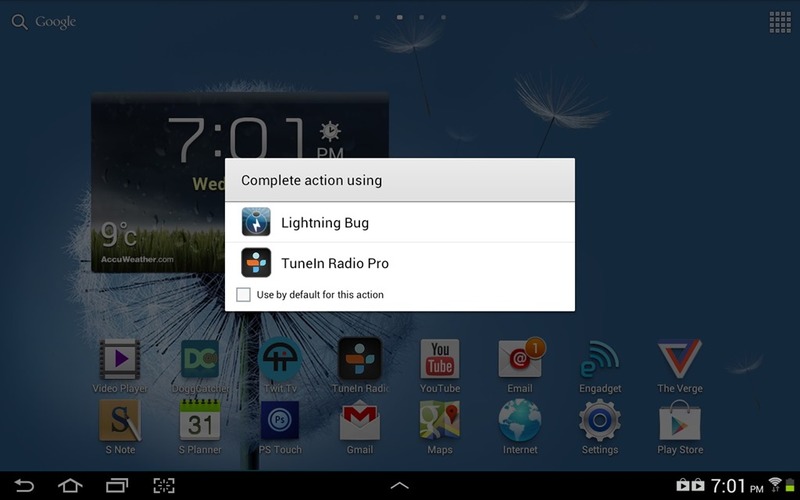 When the tablet is placed in the dock it brings up a list of possible apps to choose from, in my case it was Lightning Bug and TuneIn Radio. 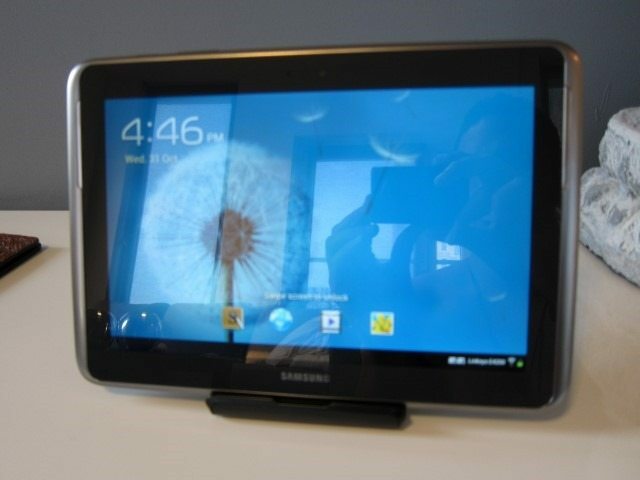 Unlike previous Samsung docks and tablet combos it doesn’t bring up a large clock, but you can program the tablet to make a sound when the tablet is connected to the tablet. 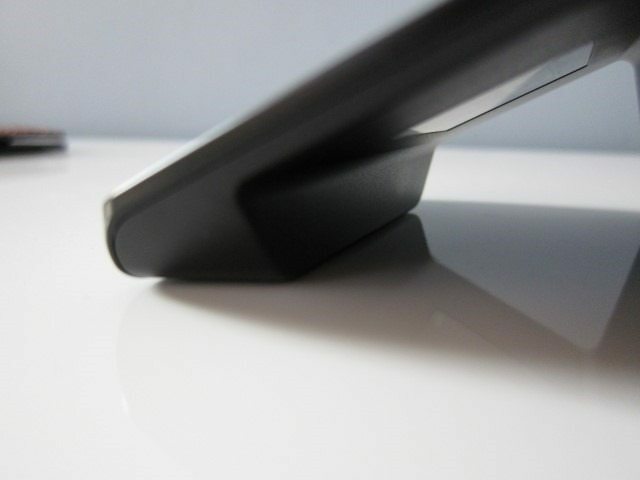 When sitting at a desk, the angle is almost right and we just wish it was tilted back a little more, but most users should be happy with Samsung’s chosen angle. It would have been nice if the angle was adjustable, but I guess that’s asking far too much from a dock. It does however act as nice stand that adds the 3.5mm audio out functionality and a nice 30 pin port on the back that allows cables and accessories to be hidden from view. In fact the 30 pin port on the back is just like the one on the Note 10.1 itself, which means it works perfectly fine with the HDTV Adapter, USB connector kit and USB Cable. It charges just fine using the Note 10.1 charging cable and adapter, but connected to the PC it will work for syncing data, but it won’t allow charging. 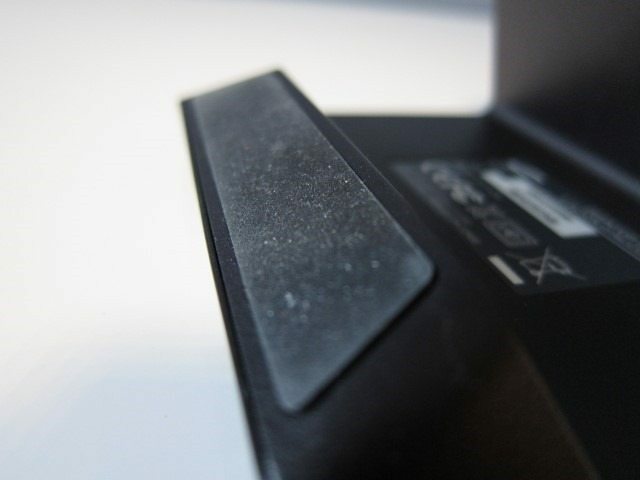 Lastly, underneath the dock there are rubber pads that will prevent the dock from sliding. 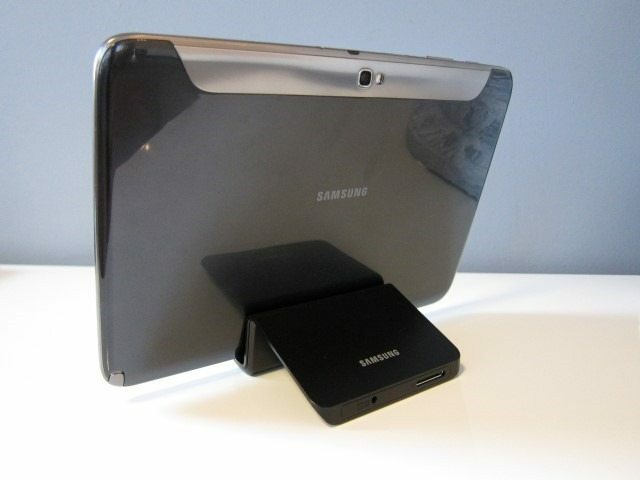 Should you buy the Desktop Dock for the Galaxy Note 10.1? 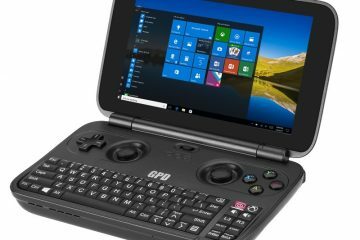 It all depends on whether you’ll be getting the Keyboard Dock which essentials has the same 3.5mm audio out and extra 30 pin port, it too works like a stand and adds the keyboard functionality. In that case I would say skip the stand and get the keyboard. But if you want to go all out, the stand is a great addition to the keyboard as it takes less space and makes it perfect for a desk or media center setup. 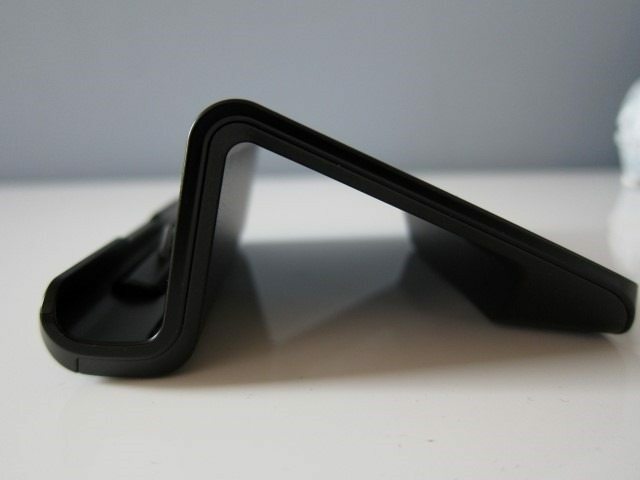 The design looks great, but just be aware that due to this very same design it allows for some play that with a hard push could potentially damage your tablet. Some care is required here. 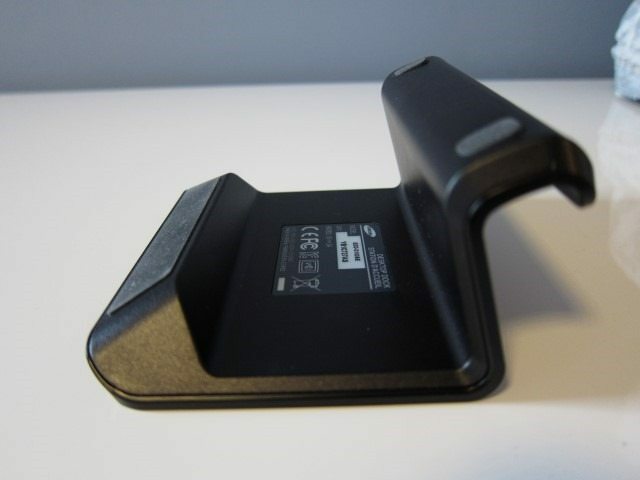 A plus point is that it works with all the Note 10.1 accessories, it’s a good stand that puts the tablet at a great angle and nicely tucks the cables and accessories out of view. 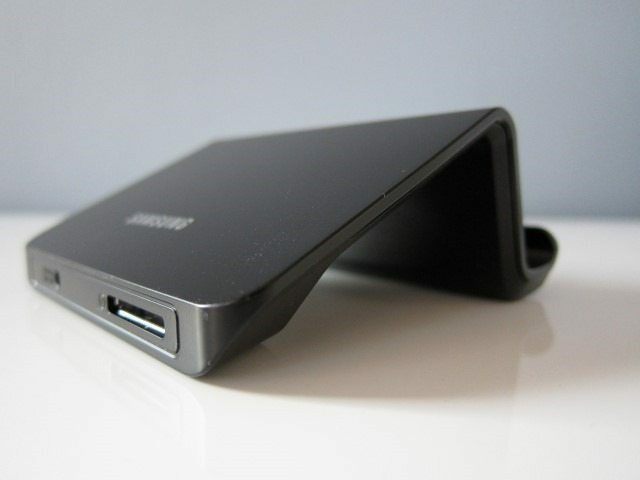 Missing however are the extra USB and an HDMI ports we’ve seen on the Smart Dock for the Note II. If you don’t plan on getting the keyboard and can live with these too omissions, the Desktop Dock is great option. Samsung should go back to the drawing board and simply add USB and HDMI. It’s still a good accessory and get an 7.7 out of 10. Works with Samsung Book Cover on. Works perfectly with the HDTV Adapter, USB connector kit and USB Cable. Quality materials and solid stand. Allows for a bit of forward movement. Accidently pressing forward against the tablet can cause damage. 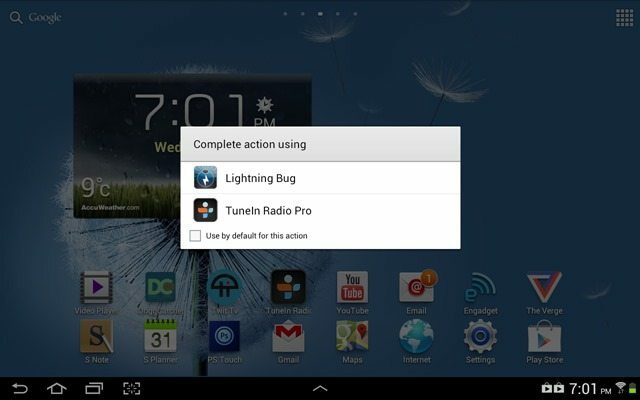 Won’t charge the Note 10.1 when connected to a PC. No USB port (s) and HDMI out. A special thanks to Mobile Fun where you can purchase this accessory and Galaxy Note 2 accessories.